We now resume our regularly scheduled programming. I’m starting off the new year with an easy comfort food since I’m sure everyone is exhausted from all the holiday cooking and eating. (If you aren’t sugared out, I hope didn’t miss my almond roca post from two weeks ago.) This a hearty, no-frills stew is full of potatoes, peas, carrots and tender pieces of meat. Nothing fancy, just warm and filling. Other than dicing some veggies and browning the meat, you just throw it in a crock pot for a few hours and come back to a meal perfect for a cozy winter evening. 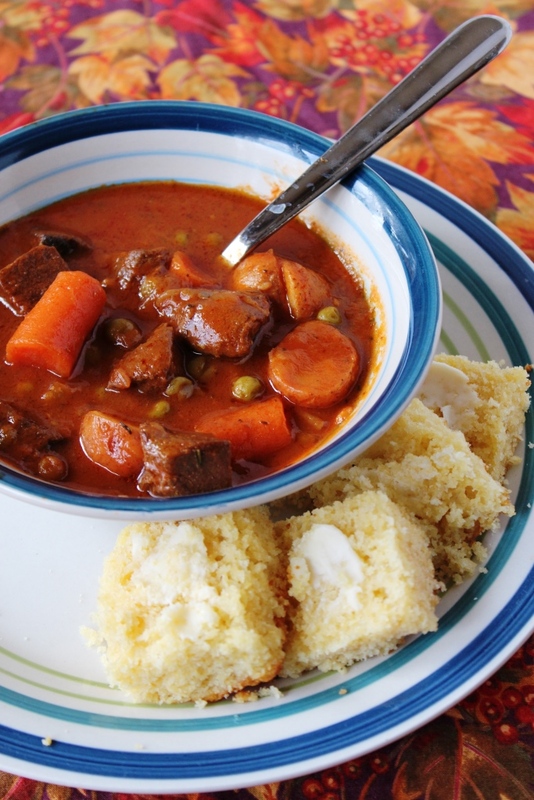 Both the stew and the cornbread make great leftovers, for about a week or a few days, respectively. 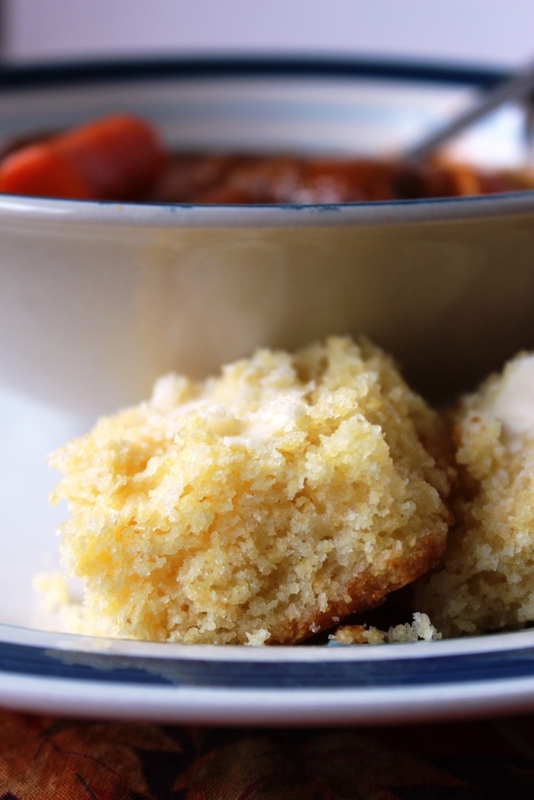 Keep the stew in the fridge and cornbread in an airtight container on the counter. I like to reheat the cornbread for about 30 seconds in the microwave with some butter for extra moisture. I happily eat this stew for several days, and think you’ll enjoy it too. 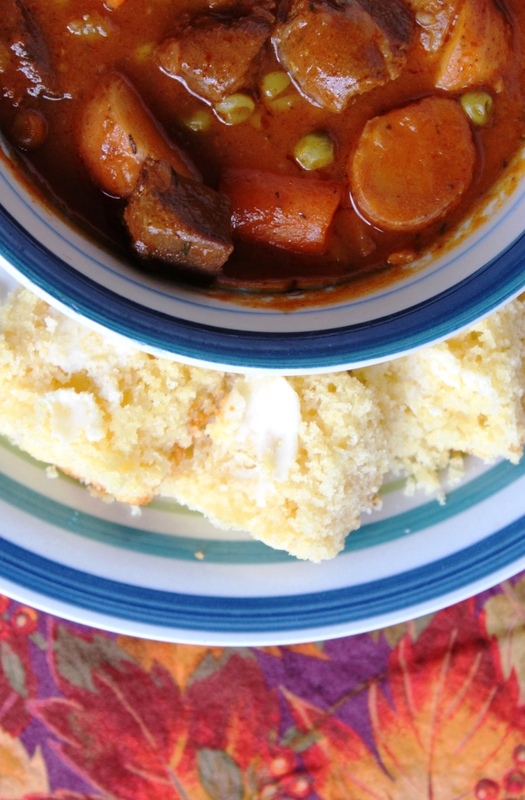 Find the recipes for both the stew and the cornbread below. Add oil to a skillet and brown meat over medium-high heat. Drain and add to slow cooker. Add V-8 juice, onion, garlic, bouillon, basil, thyme, pepper and bay leaf, stirring to combine. Cube potatoes and carrots into bite-size pieces, about 1″, and carefully add to slow cooker. Add as many potatoes and carrots as you like and will fit. 1 If you don’t have basil, you can substitute oregano. 2 I love potatoes and carrots, so I added a bunch. Start with the lesser amount and add more to taste. No need to peel them unless you really want to. 3 I like to add the peas when I put the cornbread in the oven. Grease a 9×9″ or 8×8″ baking pan and preheat oven to 400 degrees Fahrenheit. Whisk together dry ingredients in a medium bowl; make a well in the center. In a small bowl, lightly beat eggs. Add remaining ingredients and whisk gently. Pour wet ingredients into the well and stir gently until just combined. Pour into prepared baking pan. Bake for 20-25 minutes for a 9×9 pan, or 25-30 minutes for an 8×8 pan. Cornbread should be nicely browned and a toothpick inserted into the center should come out clean. Let cool for a few minutes, then serve with butter and honey, if desired.